FINE GAEL HAS encouraged its new TDs and councillors to be authentic and not to be afraid of being themselves when using Facebook and Twitter in a revealing social media guide. The party, which has its own dedicated digital media team, produced an extensive 24-page best practice guide to social media for its general election candidates. It is now planning a refresher course for newly-elected TDs and councillors, who have been co-opted to vacant local authority seats, later this month. Eyebrows were raised during February’s election campaign when several Fine Gael ministers sent identical tweets during the live TV debates as the party attempted to keep everyone on message. “Social media allows a candidate to broadcast, engage with and listen to voters. It’s the world’s online public space, a one-to-many communications platform where conversations happen that shape opinions,” the guide states in its introductory text. Speak in an authentic voice about the issues that matter to you and your constituents. It also encourages them to keep the word count of their posts as short as possible and to post in the evening when most people Facebook. Humour, insight into your personal life and showing a more human side works best on social media. Don’t be afraid to be yourself. There is also extensive information on how to access information on how popular posts are, report abuse, hide comments, and create adverts on Facebook. On Twitter, the guide says that the site allows a candidate to”pull back the curtain and give your constituents a peek into your daily life”. Whether you’re snapping a family “selfie” on the campaign trail or announcing breaking news, each tweet demystifies the process and personalities of politics by letting your followers learn a little more about you. Candidates are encouraged to approach Twitter “holistically but with strategy around specific Tweets” saying conversations on Twitter are “just like the face-to-face encounters you have with constituents each day”. The guide says there should be no limit to how often a candidate posts, that it should tag journalists in posts they might be interested in. They are also urged to use established hashtags and not to make up their own ones. People love to see the other side to their public representative, use Twitter to give people a greater insight into your daily life as a politician. On video, the guide provides a step-by-step guide to shooting video, encouraging candidates to make three types of video: a campaign diary, an interview or an introduction to themselves. Budding filmmakers are urged to keep it simple, less than two minutes long and to ensure the quality is of “basic acceptable standard”. The party’s digital media team is running workshops for newly-elected TDs and co-opted councillors next month. The events will focus on what they need to do to develop and maintain their social media presence between now and the next election. 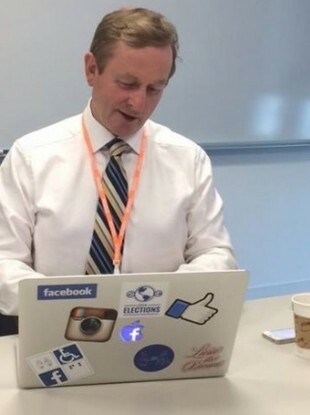 Email “'Don't be afraid to be yourself': Fine Gael's secret social media strategy for TDs ”. Feedback on “'Don't be afraid to be yourself': Fine Gael's secret social media strategy for TDs ”.